"Pearlescent" redirects here. For the type of paint, see Pearlescent coating. "Iridescent" redirects here. For the Linkin Park song, see Iridescent (song). For the Brockhampton album, see Iridescence (album). Iridescence (also known as goniochromism) is the phenomenon of certain surfaces that appear to gradually change colour as the angle of view or the angle of illumination changes. Examples of iridescence include soap bubbles, butterfly wings and seashells, as well as certain minerals. It is often created by structural coloration (microstructures that interfere with light). Pearlescence is a related effect where some or all of the reflected light is white, where iridescent effects produce only other colours. The term pearlescent is used to describe certain paint finishes, usually in the automotive industry, which actually produce iridescent effects. The word iridescence is derived in part from the Greek word ἶρις îris (gen. ἴριδος íridos), meaning rainbow, and is combined with the Latin suffix -escent, meaning "having a tendency toward". Iris in turn derives from the goddess Iris of Greek mythology, who is the personification of the rainbow and acted as a messenger of the gods. Goniochromism is derived from the Greek words gonia, meaning "angle", and chroma, meaning "colour". Fuel on top of water creates a thin film, which interferes with the light, producing different colours. The different bands represent different thicknesses in the film. An iridescent biofilm on the surface of a fishtank diffracts the reflected light, displaying the entire spectrum of colours. Red is seen from longer angles of incidence than blue. Iridescence is an optical phenomenon of surfaces in which hue changes with the angle of observation and the angle of illumination. It is often caused by multiple reflections from two or more semi-transparent surfaces in which phase shift and interference of the reflections modulates the incidental light (by amplifying or attenuating some frequencies more than others). 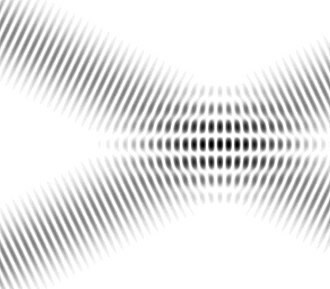 The thickness of the layers of the material determines the interference pattern. 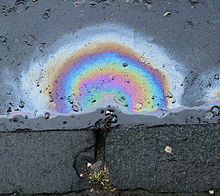 Iridescence can for example be due to thin-film interference, the functional analogue of selective wavelength attenuation as seen with the Fabry–Pérot interferometer, and can be seen in oil films on water and soap bubbles. Iridescence is also found in plants, animals and many other items. The range of colours of natural iridescent objects can be narrow, for example shifting between two or three colours as the viewing angle changes, or a wide range of colours can be observed. Iridescence can also be created by diffraction. This is found in items like CDs, DVDs, some types of prisms, or cloud iridescence. 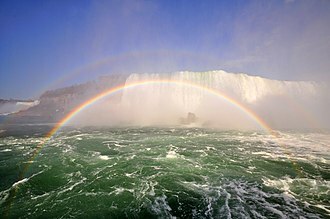 In the case of diffraction, the entire rainbow of colours will typically be observed as the viewing angle changes. In biology, this type of iridescence results from the formation of diffraction gratings on the surface, such as the long rows of cells in striated muscle, or the specialized abdominal scales of peacock spider Maratus robinsoni and M. chrysomelas. Some types of flower petals can also generate a diffraction grating, but the iridescence is not visible to humans and flower-visiting insects as the diffraction signal is masked by the coloration due to plant pigments. 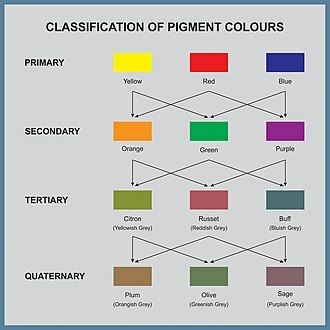 In biological (and biomimetic) uses, colours produced other than with pigments or dyes are called structural coloration. 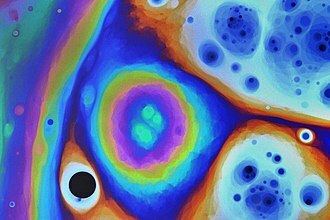 Microstructures, often multilayered, are used to produce bright but sometimes non-iridescent colours: quite elaborate arrangements are needed to avoid reflecting different colours in different directions. Structural coloration has been understood in general terms since Robert Hooke's 1665 book Micrographia, where Hooke correctly noted that since the iridescence of a peacock's feather was lost when it was plunged into water, but reappeared when it was returned to the air, pigments could not be responsible. It was later found that iridescence in the peacock is due to a complex photonic crystal. Pearlescence is an effect related to iridescence and has a similar cause. Structures within a surface cause light to be reflected back, but in the case of pearlescence some or all of the light is white. Artificial pigments and paints showing an iridescent effect are often described as pearlescent, for example when used for car paints. The feathers of birds such as kingfishers, birds-of-paradise, hummingbirds, parrots, starlings, grackles, ducks, and peacocks are iridescent. The lateral line on the neon tetra is also iridescent. A single iridescent species of gecko, Cnemaspis kolhapurensis, was identified in India in 2009. The tapetum lucidum, present in the eyes of many vertebrates, is also iridescent. Many groups of plants have developed iridescence as an adaptation to use more light in dark environments such as the lower levels of tropical forests. The leaves of Southeast Asia's Begonia pavonina, or peacock begonia, appear iridescent azure to human observers due to each leaf's thinly layered photosynthetic structures called iridoplasts that absorb and bend light much like a film of oil over water. Iridescences based on multiple layers of cells are also found in the lycophyte Selaginella and several species of ferns. Nanocellulose is sometimes iridescent, as are thin films of gasoline and some other hydrocarbons and alcohols when floating on water. To create jewelry with crystal glass that lets light refract in a rainbow spectrum, Swarovski coats some of its products with special metallic chemical coatings and for example his Aurora Borealis gives the surface a rainbow appearance. ^ "Online Etymology Dictionary". etymonline.com. Archived from the original on 2014-04-07. ^ Meadows M.; et al. (2009). "Iridescence: views from many angles". J. R. Soc. Interface. 6: S107–S113. doi:10.1098/rsif.2009.0013.focus. PMC 2706472. PMID 19336343. Archived from the original on 2015-02-15. ^ a b Yoshioka S.; et al. (2011). "Mechanism of variable structural colour in the neon tetra: quantitative evaluation of the Venetian blind model". J. Royal Soc. Interface. 8 (54): 56–66. doi:10.1098/rsif.2010.0253. PMC 3024824. PMID 20554565. ^ Rutowski RL; et al. (2005). "Pterin pigments amplify iridescent ultraviolet signal in males of the orange sulphur butterfly, Colias eurytheme". Proc. R. Soc. B. 272 (1578): 2329–2335. doi:10.1098/rspb.2005.3216. PMC 1560183. PMID 16191648. ^ Saego AE; et al. (2009). "Gold bugs and beyond: a review of iridescence and structural colour mechanisms in beetles (Coleoptera)". J. R. Soc. Interface. 6: S165–S184. Archived from the original on 2015-02-15. ^ Hsiung, Bor-Kai; Siddique, Radwanul Hasan; Stavenga, Doekele G.; Otto, Jürgen C.; Allen, Michael C.; Liu, Ying; Lu, Yong-Feng; Deheyn, Dimitri D.; Shawkey, Matthew D. (2017-12-22). "Rainbow peacock spiders inspire miniature super-iridescent optics". Nature Communications. 8 (1): 2278. doi:10.1038/s41467-017-02451-x. ISSN 2041-1723. PMC 5741626. PMID 29273708. ^ Hsiung, Bor-Kai; Siddique, Radwanul Hasan; Jiang, Lijia; Liu, Ying; Lu, Yongfeng; Shawkey, Matthew D.; Blackledge, Todd A. (2017-01-15). "Tarantula-Inspired Noniridescent Photonics with Long-Range Order". Advanced Optical Materials. 5 (2): 1600599. doi:10.1002/adom.201600599. ISSN 2195-1071. ^ Ball, Philip (May 2012). "Nature's Color Tricks". Scientific American. 306 (5): 74–79. doi:10.1038/scientificamerican0512-74. PMID 22550931. ^ a b Zi J; et al. (2003). 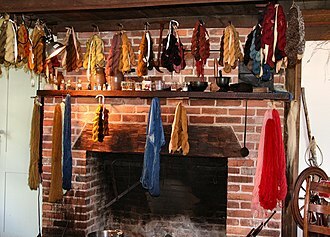 "Coloration strategies in peacock feathers". Proc. Natl. Acad. Sci. 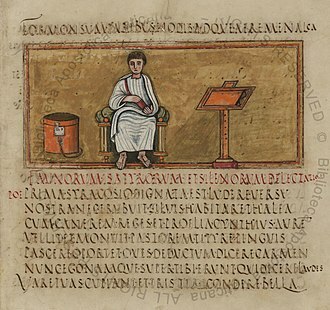 100 (22): 12576–12578. doi:10.1073/pnas.2133313100. PMC 240659. PMID 14557541. ^ Ruth Johnston-Feller (2001). 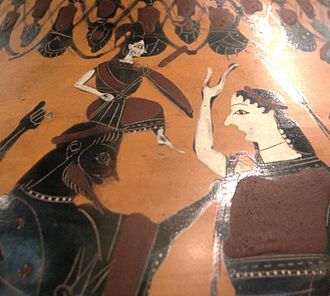 Color Science in the Examination of Museum Objects: Nondestructive Procedures. Getty Publications. pp. 169–. ISBN 978-0-89236-586-9. ^ Paint and Coating Testing Manual. ASTM International. pp. 229–. GGKEY:7W7C2G88G2J. ^ Stavenga D.G. ; et al. (2011). "Kingfisher feathers – colouration by pigments, spongy nanostructures and thin films". J. Exp. Biol. 214 (23): 3960–3967. doi:10.1242/jeb.062620. PMID 22071186. ^ Stavenga D.G. ; et al. (2010). 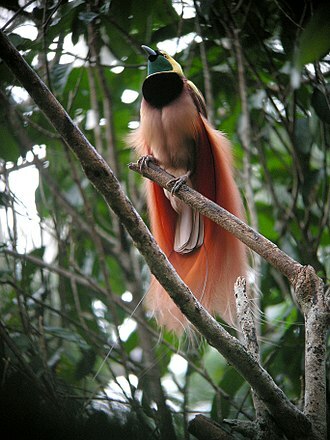 "Dramatic colour changes in a bird of paradise caused by uniquely structured breast feather barbules". Proc. R. Soc. B. 278 (1715): 2098–2104. doi:10.1098/rspb.2010.2293. PMC 3107630. PMID 21159676. ^ "New lizard species found in India". BBC Online. 24 July 2009. Retrieved 20 February 2014. ^ Engelking, Larry (2002). Review of Veterinary Physiology. Teton NewMedia. p. 90. ISBN 978-1-893441-69-9. ^ Glover, Beverley J.; Whitney, Heather M. (April 2010). "Structural colour and iridescence in plants: the poorly studied relations of pigment colour". Annals of Botany. 105 (4): 505–511. doi:10.1093/aob/mcq007. PMC 2850791. PMID 20142263. ^ Graham, Rita M.; Lee, David W.; Norstog, Knut (1993). "Physical and Ultrastructural Basis of Blue Leaf Iridescence in Two Neotropical Ferns". American Journal of Botany. 80 (2): 198–203. doi:10.2307/2445040. JSTOR 2445040. ^ Martinez-Hurtado, Juan; Akram, Muhammad; Yetisen, Ali (2013). "Iridescence in Meat Caused by Surface Gratings". Foods. 2 (4): 499–506. doi:10.3390/foods2040499. PMC 5302279. PMID 28239133. ^ Picard, G.; Simon, D.; Kadiri, Y.; LeBreux, J. D.; Ghozayel, F. (2012). "Cellulose Nanocrystal Iridescence: A New Model". Langmuir. 28 (41): 14799–14807. doi:10.1021/la302982s. PMID 22988816. ^ Zitzewitz, Paul W (2011). The Handy Physics Answer Book. Visible Ink Press. 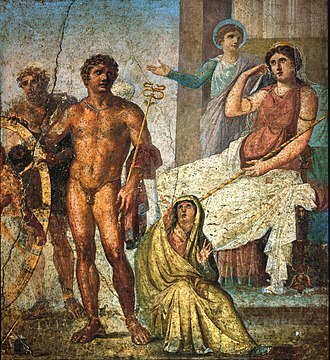 p. 215. ISBN 978-1-57859-357-6. Wikimedia Commons has media related to Iridescence. When the thickness of the film is an odd multiple of one quarter-wavelength of the light on it, the reflected waves from both surfaces interfere to cancel each other. 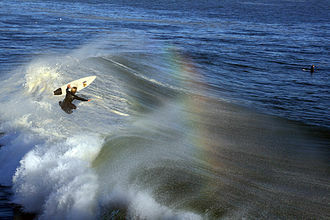 Since the wave cannot be reflected, it is transmitted instead. When the thickness is a multiple of a half-wavelength of the light, thus when white light, which consists of a range of wavelengths, is incident on the film, certain wavelengths are intensified while others are attenuated. 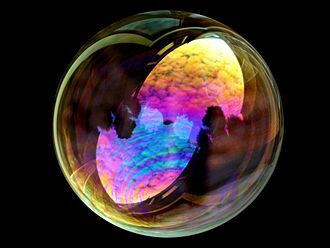 Thin-film interference explains the colors seen in light reflected from soap bubbles. It is the mechanism behind the action of antireflection coatings used on glasses, studying the light reflected or transmitted by a thin film can reveal information about the thickness of the film or the effective refractive index of the film medium. Thin films have many applications including anti-reflection coatings, mirrors. A thin film is a layer of material thickness in the sub-nanometer to micron range. As light strikes the surface of a film it is transmitted or reflected at the upper surface. Light that is transmitted reaches the surface and may once again be transmitted or reflected. The Fresnel equations provide a description of how much of the light will be transmitted or reflected at an interface. The light reflected from the upper and lower surfaces will interfere, the degree of constructive or destructive interference between the two light waves depends on the difference in their phase. This difference in turn depends on the thickness of the layer, the refractive index of the film. Additionally, a shift of 180° or π radians may be introduced upon reflection at a boundary depending on the refractive indices of the materials on either side of the boundary. This phase shift occurs if the index of the medium the light is travelling through is less than the refractive index of the material it is striking. In other words, if n 1 < n 2 and the light is travelling from material 1 to material 2, the pattern of light that results from this interference can appear either as light and dark bands or as colorful bands depending upon the source of the incident light. The peafowl include three species of birds in the genera Pavo and Afropavo of the Phasianidae family, the pheasants and their allies. There are two Asiatic species and one African species, male peafowl are known for their piercing call and their extravagant plumage. 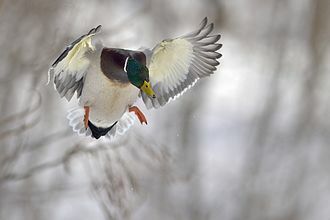 The latter is especially prominent in the Asiatic species, who have a tail or train of covert feathers which they display as part of a courtship ritual. The term peacock is properly reserved for the male, the female is known as a peahen, the functions of the elaborate iridescent coloration and large train of peacocks have been the subject of extensive scientific debate. Charles Darwin suggested they served to attract females, and the features of the males had evolved by sexual selection. The Indian peacock has iridescent blue and green plumage, the peacock tail, known as a train, consists not of tail quill feathers, but highly elongated upper tail coverts. These feathers are marked with eyespots, best seen when a peacock fans his tail, both sexes of all species have a crest atop the head. The Indian peahen has a mixture of grey, brown. The female displays her plumage to ward off female competition or signal danger to her young, the green peafowl differs from the Indian peafowl in that the male has green and gold plumage with black wings with a sheen of blue. Unlike the Indian peafowl, the green peahen is similar to the male, only having shorter upper tail coverts, a more coppery neck, the Congo peacock male does not display his covert feathers, but uses his actual tail feathers during courtship displays. These feathers are shorter than those of the Indian and green species. Females of the Indian and African species are dull grey and/or brown, chicks of both sexes in all the species are cryptically coloured. 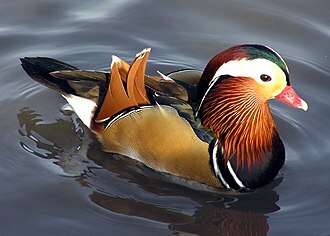 They vary between yellow and tawny, usually with patches of brown or light tan and dirty white ivory. Occasionally, peafowl appear with white plumage and this can result in the complete lack of coloration of their plumage, while preserving normal eye colour. By contrast, true albino peafowl have a lack of melanin. Micrographia, or Some Phyſiological Deſcriptions of Minute Bodies Made by Magnifying Glasses. With Observations and Inquiries Thereupon. is a significant book by Robert Hooke about his observations through various lenses. It is particularly notable for being the first book to illustrate insects, plants etc. as seen through microscopes. Published in January 1665, the first major publication of the Royal Society, it became the first scientific best-seller and it is notable for coining the biological term cell. Hooke most famously describes a flys eye and a plant cell, known for its spectacular copperplate engravings of the miniature world, particularly its fold-out plates of insects, the text itself reinforces the tremendous power of the new microscope. 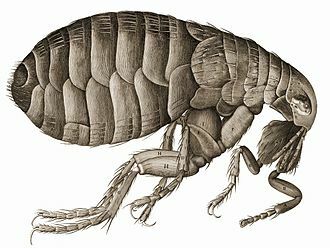 The plates of insects fold out to be larger than the large folio itself, Hooke selected several objects of human origin, among these objects were the jagged edge of a honed razor and the point of a needle, seeming blunt under the microscope. His goal may well have been as a way to contrast the flawed products of mankind with the perfection of nature, gallery Published under the aegis of The Royal Society, the popularity of the book helped further the societys image and mission of being the UKs leading scientific organization. In optics, a diffraction grating is an optical component with a periodic structure, which splits and diffracts light into several beams travelling in different directions. The emerging coloration is a form of structural coloration, the directions of these beams depend on the spacing of the grating and the wavelength of the light so that the grating acts as the dispersive element. Because of this, gratings are used in monochromators and spectrometers. For practical applications, gratings generally have ridges or rulings on their surface rather than dark lines, such gratings can be either transmissive or reflective. Gratings which modulate the phase rather than the amplitude of the incident light are produced, the principles of diffraction gratings were discovered by James Gregory, about a year after Newtons prism experiments, initially with items such as bird feathers. The first man-made diffraction grating was made around 1785 by Philadelphia inventor David Rittenhouse and this was similar to notable German physicist Joseph von Fraunhofers wire diffraction grating in 1821. Diffraction can create rainbow colors when illuminated by a wide spectrum light source, a grating has parallel lines, while a CD has a spiral of finely-spaced data tracks. Diffraction colors appear when one looks at a point source through a translucent fine-pitch umbrella-fabric covering. Decorative patterned plastic films based on reflective grating patches are very inexpensive, the relationship between the grating spacing and the angles of the incident and diffracted beams of light is known as the grating equation. Gratings may be of the reflective or transmissive type, analogous to a mirror or lens, respectively. A grating has a mode, in which there is no diffraction. An idealised grating is considered here which is made up of a set of slits of spacing d, assuming a plane wave of monochromatic light of wavelength λ with normal incidence, each slit in the grating acts as a quasi point-source from which light propagates in all directions. After light interacts with the grating, the light is composed of the sum of interfering wave components emanating from each slit in the grating. Cloud iridescence is the occurrence of colors in a cloud similar to those seen in oil films on puddles, located in the general vicinity of the sun or moon. It is a common phenomenon, most often observed in altocumulus, lenticular clouds. The colors are usually pastel, but can be very vivid, when occurring near the sun, the effect can be difficult to spot as it is drowned in the suns glare. This may be overcome by blocking the sun with ones hand or hiding it behind a tree or building, other aids are dark glasses, or observing the sky reflected in a convex mirror or in a pool of water. The effect is similar to irisation, Iridescent clouds are a diffraction phenomenon caused by small water droplets or small ice crystals individually scattering light. Larger ice crystals do not produce iridescence, but can cause halos, if parts of clouds contain small water droplets or ice crystals of similar size, their cumulative effect is seen as colors. The cloud must be thin, so that most rays encounter only a single droplet. Hummingbirds are birds from the Americas that constitute the family Trochilidae. 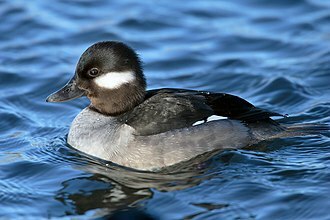 They are among the smallest of birds, most species measuring 7. 5–13 cm, the smallest extant bird species is a hummingbird, the 5-cm bee hummingbird weighing less than 2.5 g. They are known as hummingbirds because of the sound created by their beating wings which flap at high frequencies audible to humans. They hover in mid-air at rapid wing-flapping rates, typically around 50 times per second, hummingbirds have the highest metabolism of any homeothermic animal. To conserve energy when food is scarce, and nightly when not foraging, they go into torpor, a map of the hummingbird family tree—reconstructed from analysis of 284 of the worlds 338 known species—shows rapid diversification from 22 million years ago. Due to this exceptional evolutionary pattern, as many as 140 hummingbird species can coexist in a specific region, the hummingbird evolutionary tree shows ancestral hummingbirds splitting from insectivorous swifts and treeswifts about 42 million years ago, probably in Eurasia. 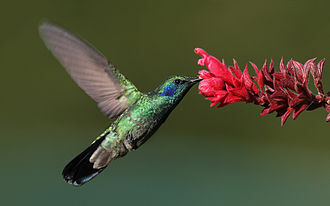 One key evolutionary factor appears to be an altered taste receptor that enabled hummingbirds to seek nectar, by 22 million years ago the ancestral species of current hummingbirds became established in South America, where environmental conditions stimulated further diversification. The Andes Mountains appear to be a rich environment for hummingbird evolution because diversification occurred simultaneously with mountain uplift over the past 10 million years. 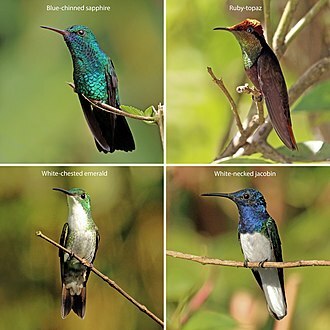 Hummingbirds remain in dynamic diversification inhabiting ecological regions across South America, North America, within the same geographic region, hummingbird clades co-evolved with nectar-bearing plant clades, affecting mechanisms of pollination. The same is true for the hummingbird, one of the morphologically most extreme species. Hummingbirds exhibit sexual size dimorphism according to Renschs rule, in males are smaller than females in small species. The extent of sexual size difference varies among clades of hummingbirds. For example, the Mellisugini clade exhibits a large size dimorphism, the Lophomithini clade displays very little size dimorphism and females are similar in size. The birds-of-paradise are members of the family Paradisaeidae of the order Passeriformes. The majority of species are found in eastern Indonesia, Papua New Guinea, the family has 42 species in 15 genera. For the most part they are confined to dense rainforest habitat, the diet of all species is dominated by fruit and to a lesser extent arthropods. The birds-of-paradise have a variety of breeding systems, ranging from monogamy to lek-type polygamy, a number of species are threatened by hunting and habitat loss. For many years the birds-of-paradise were treated as being related to the bowerbirds. Today while both are treated as being part of the Australasian lineage Corvida, the two are now thought to be distantly related. The closest evolutionary relatives of the birds-of-paradise are the crow and jay family Corvidae, the monarch flycatchers Monarchidae, the second clade includes the parotias and the King of Saxony bird-of-paradise. The third clade provisionally contains a number of genera, the Drepanornis sicklebills, Semioptera and Lophorina, the fourth clade includes the Epimachus sicklebills and the astrapias. 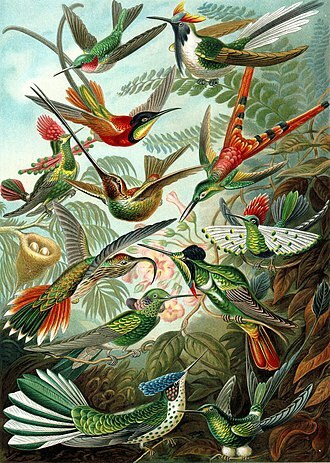 The final clade includes the Cicinnurus and the Paradisaea birds-of-paradise, the exact limits of the family have been the subject of revision as well. 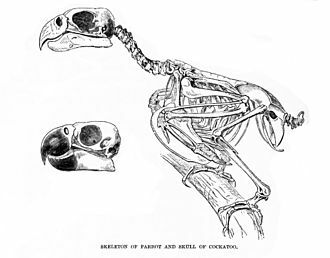 The three species of satinbird were treated as a subfamily of the birds-of-paradise, Cnemophilinae, in spite of differences in the mouth, foot morphology and nesting habits they remained in the family until a 2000 study moved them to a separate family closer to the berrypeckers and longbills. The same study found that the Macgregors bird-of-paradise was actually a member of the large Australasian honeyeater family, in addition to these three species, a number of systematically enigmatic species and genera have been considered potential members of this family. The silktail of Fiji has been linked with the many times since its discovery. Recent molecular evidence now places the species with the fantails, hybrid birds-of-paradise may occur when individuals of different species, that look similar and have overlapping ranges, confuse each other for their own species and crossbreed. Parrots, known as psittacines /ˈsɪtəsaɪnz/, are birds of the roughly 393 species in 92 genera that make up the order Psittaciformes, found in most tropical and subtropical regions. The order is subdivided into three superfamilies, the Psittacoidea, the Cacatuoidea, and the Strigopoidea, Parrots have a generally pantropical distribution with several species inhabiting temperate regions in the Southern Hemisphere, as well. The greatest diversity of parrots is in South America and Australasia, characteristic features of parrots include a strong, curved bill, an upright stance, strong legs, and clawed zygodactyl feet. Many parrots are vividly coloured, and some are multi-coloured, most parrots exhibit little or no sexual dimorphism in the visual spectrum. They form the most variably sized bird order in terms of length, the most important components of most parrots diets are seeds, fruit and other plant material. A few species sometimes eat animals and carrion, while the lories and lorikeets are specialised for feeding on floral nectar, almost all parrots nest in tree hollows, and lay white eggs from which hatch altricial young. Parrots, along with ravens, crows and magpies, are among the most intelligent birds, some parrots are intelligent and talk at the level of a four-to-five year old human. Measures taken to conserve the habitats of some high-profile charismatic species have protected many of the less charismatic species living in the same ecosystems. Psittaciform diversity in South America and Australasia suggests that the order may have evolved in Gondwana, molecular studies suggest that parrots evolved approximately 59 million years ago in Gondwana. The three major clades of Neotropical parrots originated about 50 Mya, the earliest parrots do not have the specialised crushing bills of modern species. 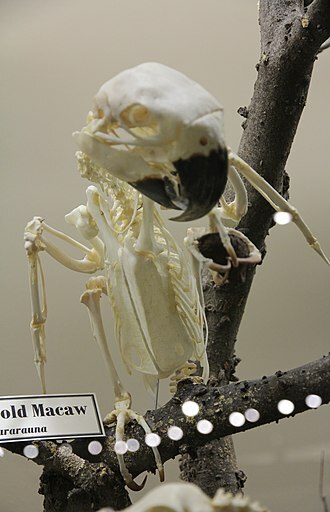 If so, they probably had not evolved their morphological autapomorphies yet, the combined evidence supported the hypothesis of Psittaciformes being near passerines, i. e. the mostly land-living birds that emerged in close proximity to the K-Pg extinction. 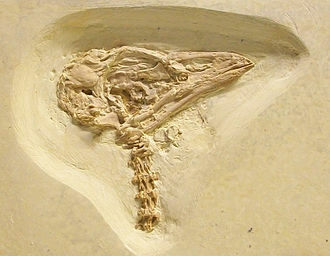 Europe is the origin of the first undeniable parrot fossils, which date from about 50 Mya, the climate there and was tropical, consistent with the Paleocene-Eocene thermal maximum. 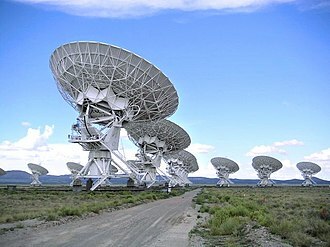 Amplitude modulation is a modulation technique used in electronic communication, most commonly for transmitting information via a radio carrier wave. In amplitude modulation, the amplitude of the wave is varied in proportion to the waveform being transmitted. That waveform may, for instance, correspond to the sounds to be reproduced by a loudspeaker and this technique contrasts with frequency modulation, in which the frequency of the carrier signal is varied, and phase modulation, in which its phase is varied. AM was the earliest modulation method used to transmit voice by radio and it was developed during the first two decades of the 20th century beginning with Roberto Landell De Moura and Reginald Fessendens radiotelephone experiments in 1900. 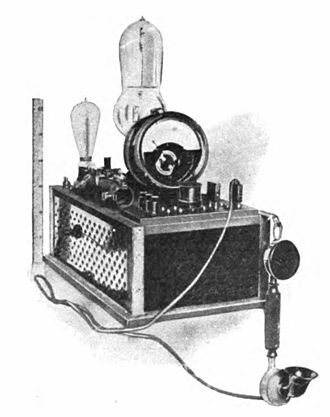 It remains in use today in many forms of communication, for example it is used in two way radios, VHF aircraft radio, Citizens Band Radio, and in computer modems. AM is often used to refer to mediumwave AM radio broadcasting, when it reaches its destination, the information signal is extracted from the modulated carrier by demodulation. In amplitude modulation, the amplitude or strength of the oscillations is what is varied. For example, in AM radio communication, a continuous wave signal has its amplitude modulated by an audio waveform before transmission. The audio waveform modifies the amplitude of the wave and determines the envelope of the waveform. In the frequency domain, amplitude modulation produces a signal with power concentrated at the carrier frequency, each sideband is equal in bandwidth to that of the modulating signal, and is a mirror image of the other. Standard AM is thus sometimes called double-sideband amplitude modulation to distinguish it more sophisticated modulation methods based on AM. One disadvantage of all amplitude modulation techniques is that the receiver amplifies and detects noise, increasing the received signal to noise ratio, say, by a factor of 10, thus would require increasing the transmitter power by a factor of 10. For this reason AM broadcast is not favored for music and high fidelity broadcasting, another disadvantage of AM is that it is inefficient in power usage, at least two-thirds of the power is concentrated in the carrier signal. A soap bubble is an extremely thin film of soapy water enclosing air that forms a hollow sphere with an iridescent surface. Soap bubbles usually last for only a few seconds before bursting and they are often used for childrens enjoyment, but they are used in artistic performances. Assembling several bubbles results in a foam, when light shines onto a bubble it appears to change colour. Depending on the thickness of the film, different colours interfere constructively and destructively, Soap bubbles are physical examples of the complex mathematical problem of minimal surface. They will assume the shape of least surface area possible containing a given volume, a true minimal surface is more properly illustrated by a soap film, which has equal pressure on inside as outside, hence is a surface with zero mean curvature. A soap bubble is a soap film, due to the difference in outside and inside pressure. This has been dubbed the double bubble conjecture, due to these qualities soap bubbles films have been used with practical problem solving application. A famous example is his West German Pavilion at Expo 67 in Montreal, when two bubbles merge, they adopt a shape which makes the sum of their surface areas as small as possible, compatible with the volume of air each bubble encloses. If the bubbles are of size, their common wall is flat. If they arent the same size, their common wall bulges into the bubble, since the smaller one has a higher internal pressure than the larger one. At a point where three or more bubbles meet, they sort themselves out so only three bubble walls meet along a line. Since the surface tension is the same in each of the three surfaces, the three angles between them must be equal to 120°, only four bubble walls can meet at a point, with the lines where triplets of bubble walls meet separated by cos−1 ≈109. 47°. All these rules, known as Plateaus laws, determine how a foam is built from bubbles, the longevity of a soap bubble is limited by the ease of rupture of the very thin layer of water which constitutes its surface, namely a micrometer-thick soap film. A single light soap bubble photograph taken under macro photography. A single soap bubble displaying three layers. Most butterflies fly by day, most moths by night: but Arctia caja is day-flying. Five stages of biofilm development: (1) Initial attachment, (2) Irreversible attachment, (3) Maturation I, (4) Maturation II, and (5) Dispersion. Each stage of development in the diagram is paired with a photomicrograph of a developing P. aeruginosa biofilm. All photomicrographs are shown to the same scale. Mats of bacterial biofilm color the hot springs in Yellowstone National Park. The longest raised mat area is about half a meter long. Thermophilic bacteria in the outflow of Mickey Hot Springs, Oregon, approximately 20 mm thick. An incandescent light bulb viewed through a transmissive diffraction grating. Posthumous portrait of Robert Hooke (Rita Greer 2004), based on descriptions by Aubrey and Waller; no contemporary depictions of Hooke are known to survive. Memorial portrait of Robert Hooke at Alum Bay, Isle of Wight, his birthplace, by Rita Greer (2012). The opal in this bracelet contains a natural periodic microstructure responsible for its iridescent color. It is essentially a natural photonic crystal. 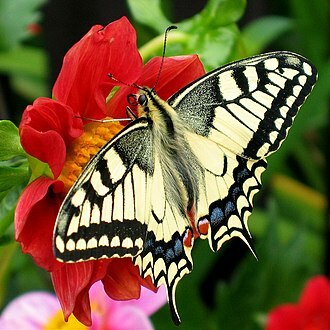 Wings of some butterflies contain photonic crystals. Fruits of the genus Schefflera are an important part of the diet of the ribbon-tailed astrapia. 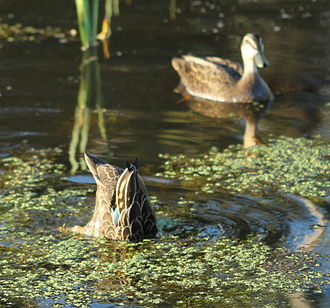 Pacific black duck displaying the characteristic upending "duck". A colorful interference pattern is observed when light is reflected from the top and bottom boundaries of a thin oil film. The different bands form as the film's thickness diminishes from a central runoff-point. Thin-film interference caused by ITO defrosting coating on an Airbus cockpit window. Gasoline on water shows a pattern of bright and dark fringes when illuminated with 589nm laser light. Morpho didius This specimen is a gynandromorph (Musée d'histoire naturelle de Lille). The single remix of "Iridescent" was performed live at Red Square (pictured) in Moscow. One of the crude pre-vacuum tube AM transmitters, a Telefunken arc transmitter from 1906. The carrier wave is generated by 6 electric arcs in the vertical tubes, connected to a tuned circuit. Modulation is done by the large carbon microphone (cone shape) in the antenna lead. 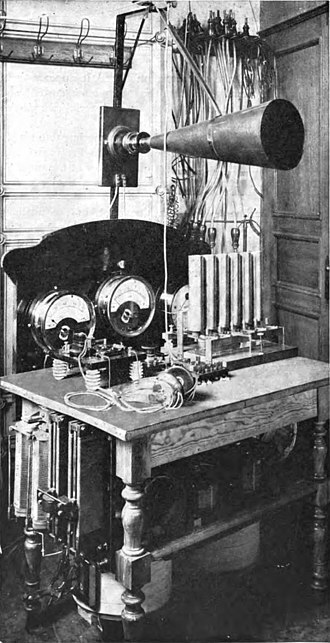 One of the first vacuum tube AM radio transmitters, built by Meissner in 1913 with an early triode tube by Robert von Lieben. He used it in a historic 36 km (24 mi) voice transmission from Berlin to Nauen, Germany. Compare its small size with above transmitter.